The Republican Party has spent years making it harder for black people to vote, so it was perhaps only a matter of time before everyday citizens joined them. Two such incidents in Georgia have made national headlines this fall. 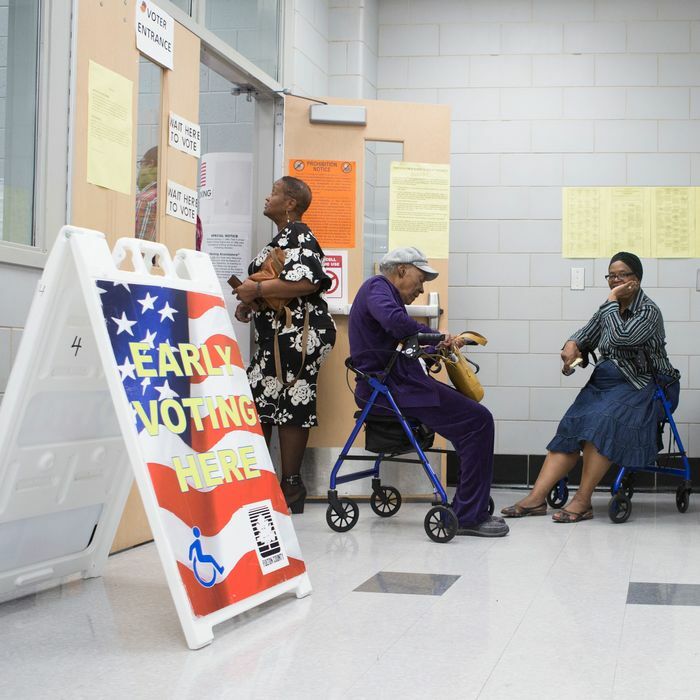 Responding to a tip on October 15, a Jefferson County clerk ordered 40 black senior citizens off a bus that was taking them to vote. According to the Atlanta Journal-Constitution, the clerk phoned the senior center in Louisville where they lived with concerns about the ride, which was organized at the residents’ request by the nonpartisan group Black Voters Matter. Officials later said the event constituted unauthorized “political activity” because the chairwoman of the county Democratic Party was involved. “We knew it was an intimidation tactic,” LaTosha Brown, co-founder of Black Voters Matter, told the AJC. Reports about voter suppression in Georgia have rightly focused on Brian Kemp, the state’s roll-purging Republican secretary of state who is overseeing his own election as he runs for governor. But with November 6 looming, the involvement of everyday citizens in enforcing Kemp’s mandates tells an equally profound story. In both cases outlined above, it was not Kemp’s office seeking to intimidate black would-be voters and voting organizers. It was local officials responding to the whims of residents who had phoned with their own concerns. The weight of vigilante voter suppression is hard to understand without knowing its historical roots. In the Jim Crow South, officials at the state and local levels allied regularly with white residents to stop black people from voting. Such efforts were famously marked by violence. But perhaps the most analogous to today demonstrate how empowered everyday whites felt to thwart the black vote by means shy of murder and mutilation. Segregationist Eugene Talmadge won the 1946 governor’s race using a tactic predicated on suppressive vigilantism. “Talmadge supporters were urged to take advantage of an obscure law that let any citizen challenge any other citizen’s right to vote for any of several reasons,” wrote historian Donald L. Grant in The Way It Was in the South. “Thousands of challenge forms were mailed to white rural voters.” In 1962, a dozen whites accompanied by Sheriff Zeke Matthews and three of his deputies entered a black voter-registration rally in Sasser, Georgia. “We want our colored people to go on living like they have for the past 100 years,” the sheriff said. The invaders proceeded to record the names of those present, while Matthews inveighed against “this registering business” and made threats about what “disturbed white citizens might do” if it continued. Today’s southerners are heirs to this legacy. Following long-held tradition, some in Georgia have witnessed black voting efforts and responded by summoning law enforcement and other officials, prompting intimidating encounters that broadcast the risks of suffrage to other would-be black voters. It is true that Brian Kemp plays an outsize role in suppression efforts. He currently has 53,000 voter registration applications on hold, 70 percent of which were filed by black applicants, and in what seems a desperate act announced an attempted hacking investigation into the state’s Democratic Party on Sunday, for which he provided no evidence. But his real legacy transcends the reach of his office. During his tenure, he has advanced a culture whereby black votes are inherently suspect and open to challenge. That civilians are drawn and empowered to help him shows that his suppressive aims are shared across class, place, and profession. And such an alliance is likely to hound black Georgians long after Tuesday’s election.